Amidst daily chores of life, a human being feels exhausted and burn out happens faster now even if all materialistic items of comfort are available at the click of a button. The person should have more time for self in wake of these comforts but the reverse is happening. In order to connect with self, DJJS across India organizes monthly spiritual congregation to reinvigorate the parched souls. One such event was held at Amravati on 17th February, 2019. 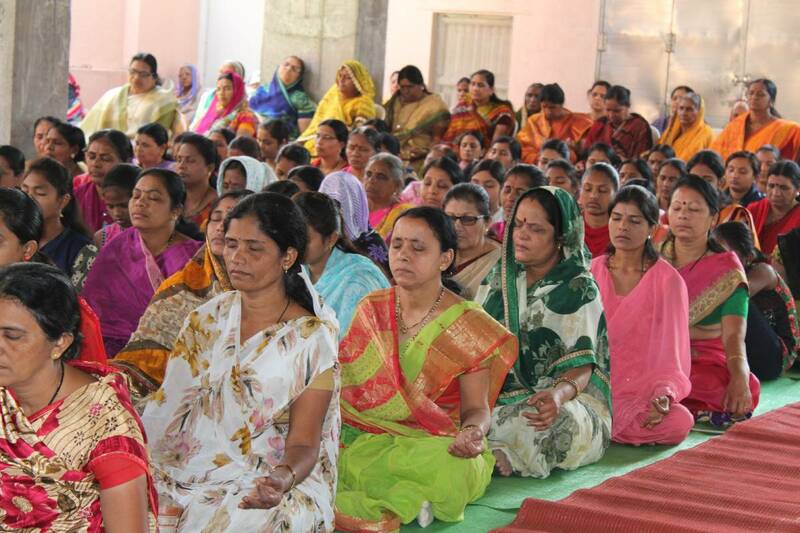 A large number of devotees attended the event from all over Maharashtra. Preacher disciple of Shri Ashutosh Maharaj Ji spoke on the topic of development of all layers of personality through the Dhyan process of Brahm Gyan. Sadhvi Ji said that expensive clothes that a person wears give only a superficial picture of one’s personality. She cited the example of Swami Vivekanand- once Vivekanand ji was going to deliver a speech in USA, where the organizer of that program passed a remark on his humble clothing. Swami Ji replied- in America does the tailor sew the personality of an individual as in our country back in Bharat, it is the character which defines personality? Sadhvi Ji said that all differences and conflicts only lie in the superficial layers. Beneath all uniforms, single God resides. This innermost layer of one’s soul can be realized through the divine knowledge of Brahm Gyan. An intelligent person who dwells in the mental level has the ability to work through its intelligence and mental powers to overcome physical pains. Similarly, the one whose soul is awakened can cross the limitations and obstacles of mind and develops the ability to think freely above all boundaries. Sadhvi Ji further explained that a spiritually realized person focuses on continuous improvement and learning thereby can see positivity in the most negative of circumstances also. She gave a beautiful example- a defective watch also shows the right time twice a day, in the same way there is always something worth being happy in a gloomy situation as well. Speaking more on the soul, Sadhvi Ji said that in the ‘Bhagwat Geeta’, Lord Krishna has said- the soul can neither be torn by any weapon, nor be burnt by fire. Soul cannot be made wet by water nor be withered by the wind. The soul is ageless and deathless. Hence, wise are those who realize the soul during their lives and stay focused on the soul every moment of their lives. The individual, who meditates upon the divine light, knows the right direction in all phases of life. Just like Lord Krishna initiated His ardent disciple Arjun with Brahm Gyan, in the present era, Shri Ashutosh Maharaj Ji has been imparting divine knowledge to hundreds and thousands of inquisitive devotees all over the world. These sincere devotees who are imparted with Brahm Gyan selflessly lend their hands in propagating this divine message of Brahm Gyan to all people in the world. At the congregation also, selfless volunteers were actively fulfilling their duties with devotion and humility. A huge gathering was feeling indebted after attending the event since the soul was satiated with divine nectar. The day is not far when everyone will realize the worth of this divine knowledge and become a part of this mission of World peace.